The trip will take approx 3.5 hours to reach Mt Buller Village. Travel via theHume HighwaytoSeymourto join theGoulburn Valley Highwayvia Yea. Continue ontoMansfieldvia theMaroondah Highway. Follow the signs to Mt Buller fromMansfield. Alternatively, take theMaroondah Highwayand travel until the turn off at Coldstream. Head alongMelba Highway, which will take you to Yea before re-joining theMaroondah Highway, then head forMansfield. Chains must be carried in all Alpine areas by law. You can hire chains in Bonnie Doon, Mansfield, Merrijig and Mirimbah, it is a good idea to ask how they are fitted. You will be informed at the Gate whether you need to fit them or not. Make sure you have anti freeze or glycol in your radiator or an Alpine diesel mix if your car runs on diesel. TIPS & INFORMATION – WHAT TO DO ON ARRIVAL. Located at Mirimbah, on theMt Buller Road(15km before Mt Buller Village) is the Resort Entry Gate. Here you will be advised on road conditions and asked to pay the entry fee and also the oversnow taxi fees (required only if you are staying overnight). 1. 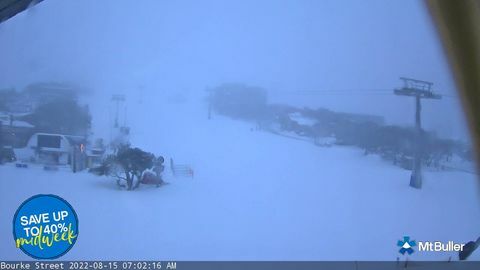 Visit the Mt Buller website homepage or Mt Buller Live app for resort entry purchasing. Alternatively go to the following link: https://ssl2.connectintouch.com/wp.dll?Axis/MtBullerRMB. 2. Purchase resort entry, overnight parking and taxi tickets. 3. Print a vehicle entry pass before commencing the journey to Mt Buller, which is to be displayed in the windscreen of the vehicle. This applies to both day and overnight visitors. a. Customers that are unable to print their pass before leaving may collect it from a staff member at Mirimbah resort entry. 4. Upon arrival at Mirimbah resort entry, customers with a pass can utilise the ‘Express Lane’, which is clearly signposted. Overnight guests must collect their taxi tickets at Mirimbah resort entry as these cannot be printed at home. Follow the well maintained road up the mountain. Private cars are now allowed into the Village, so at the car parks, you will be met by an attendant, who will show you where to park. A 4WD Oversnow taxi will then take you to where you are staying on the mountain. Make sure your luggage is waterproof, as luggage is placed on top of the vehicle and will get wet if it is snowing. Taxis operate from 7.00 am until MIDNIGHT – Sunday through Thursday. This includes 2 items of luggage (per person) plus skis, boots and poles or Snowboard. Luggage in excess of 2 items will be charged at approx $7.00 per item. A surcharge applies for transport to/from car parks below Andrew’s Corner. A FREE intra village shuttle service operates from 8.00 am to 6.00 pmdaily, running every 15 minutes (approx) throughout the village, transporting sightseers and skiers without luggage. Ask at your accommodation or the bus depot about the pick up points. For Day Visitors to Mt Buller a free shuttle bus operates from the Horse Hill car park to the Village Centre between8.00 amand6.00 pm(no more than a day pack and your skis or snowboard can be carried on the shuttle). You can access the Horsehill Chairlift from the day car park which will take you directly to Spurs Restaurant and the slopes. If you wish to travel to the day car park out of these times an adult fare is $10.00 and a child $8.00 one way (approx rates). As lodges are privately owned and operated please abide by the rules and code of conduct for each lodge. Duties may apply to some lodges. BYO Linen, sleeping bag, doona, pillow case and towels apply to most lodges. Lodges are self catering and include fully equipped kitchens. Please be aware that you must clean up after yourselves after cooking etc. and clean/vacuum room on departure. Check with booking officer as per conditions regarding the lodge you have booked. If you know that you will be arriving late or you have been delayed it is a good idea to notify your lodge/hotel. They can then make suitable arrangements for your arrival and check in procedures. You may also need to arrange for an oversnow taxi by ringing them on 03 5777 6070.